Most of you probably already know that Kenny Sia is going bald for Sarawak Children’s Cancer Society’s (SCCS) “Give Hope, Go Bald” campaign. Rodney Wong, SCCS’s Chairman for Public Relations, quipped that they are nice enough to do the shave-off on the 15th, the day after Valentine’s Day so you can still have hair when you spend time with your boy/girlfriend (or with your hair, period). In Kenny’s case, he’ll be out of town on the 15th, so he’s getting shaved on the 12th instead. What you may not know is that anyone of you can collect donations for the campaign and pledge to get your head shaved as well. Sign-ups begin today at tHe Spring, but a few of us already had an early start. I meant to blog about this a lot earlier, but I was too damn busy the last couple of weeks. You probably already know this, judging by my lack of posts last month. Almost long enough to audition for an Asian horror movie, yo. But if I raise RM5,000, I too will shave my head on the 15th. It’s a statement. People will be asking you why for weeks (months if your hair is as long as mine), and you get to tell them the reason. 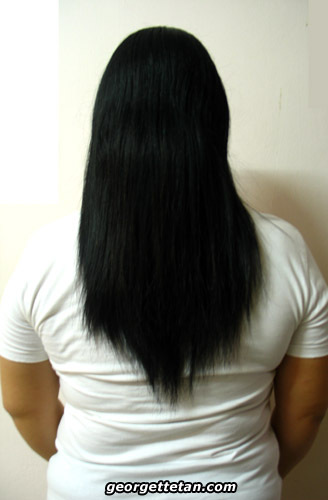 Chemotherapy makes hair fall out. Chemotherapy kill fast-growing cells. Cancer cells fall under this category. So does hair cells, among others. Most of you can think of reasons why you do NOT want to shave your head. Kids undergoing chemotherapy have no say. It’ll be silly to pick vanity over saving your life, right? For some reason, baldness is equated with ugliness and shame. 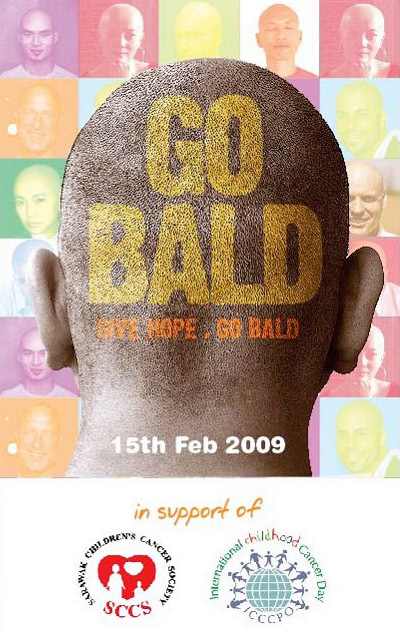 It’s true that some of us don’t look good bald, but cancer doesn’t just strike people who do look good without hair. Baldness is the least of your worries if you have cancer, but it is still the most dreaded side effect because a lot of people automatically associate hair with beauty. It’s rather strange, if you think of it. Is that all we are at the end of the day? Are we defined by our hair? What will the money be used for? I’m glad you asked. Like the name says, Sarawak Children’s Cancer Society (SCCS) provides relief and care for children suffering from cancer. The support naturally extends to their families as well. Much like my other pet cause, they do not discriminate based on race and religion. After all, cancer doesn’t discriminate either. SCCS was formed by a group of parents who have children suffering from cancer. When you are fighting a battle, it’s always good to have allies. The Society have since extended their role to assist families of outstation patients, providing not just financial and emotional support, but accommodations and provisions while they are in Kuching accompanying their child for treatment at Sarawak General Hospital (SGH). SGH doesn’t provide certain types of medical consumables – certain kinds of drugs, equipment, and blood tests outside the hospital. This is where SCCS steps in, buying things like a Central Venous Line (CVL). A CVL allow hospital personnel to draw blood from the patient or administer drugs without a needle. Being poked over and over with a needle is deeply unpleasant. Some of us can’t even deal with one injection as it is. Each CVL costs about RM500. If we raise RM5k, we can provide 10 kids with a CVL. In Sarawak, one child is diagnosed with cancer every 6 days. Childhood cancer is a curable form of cancer. Your contribution will help make life a bit more bearable for young cancer patients and their families. As of right now, I have collected RM250. I still have a long way to go. My colleagues are delighted at the idea. They have been both contributing and helping me collect donations from their respective departments. I’m glad that they are willing to share the responsibility of my possible new look because that’s what they’ll see when they walk into my side of the office. You too can contribute to my hair loss and to the SCCS funds. If you’re within Malaysia, you can make your donation via bank transfer. Please contact me (tarlia[AT]gmail.com) for the details. 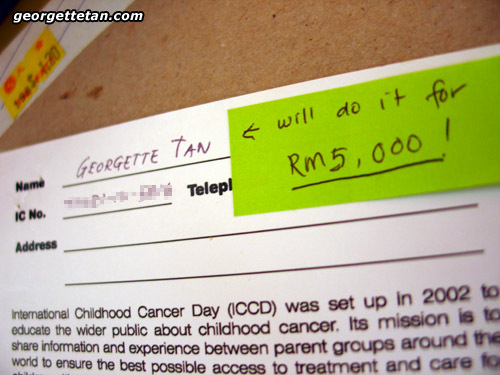 If you’re donating with a cheque, make it payable to SARAWAK CHILDREN’S CANCER SOCIETY. If you’re outside Malaysia, I’m going to direct you to Kenny Sia because he is all set up to process international donations and I’m not. I don’t really care about not adding your contribution under my grand total. All the money is going to the same cause anyway. Am I nervous? Um, I’m too busy to dwell on that. Am I gonna look funny for the next few months if this goes through? Likely! But it’s just hair. It’ll grow back. I will try my best to help you raise RM 5,000 as i hope u’ll be the first but not the last women to inspire more women to shave for this cause..and because i wish i was as bold as you! haha….your hair is as long as mine!